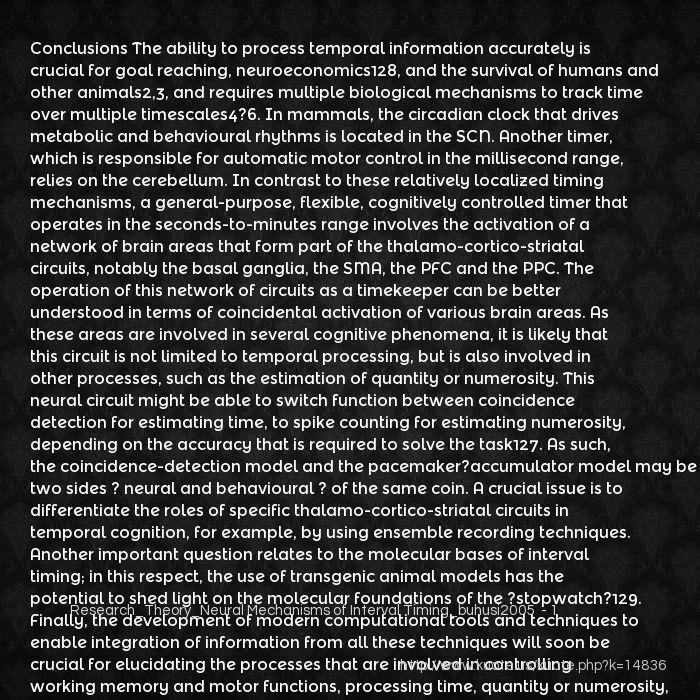 Conclusions The ability to process temporal information accurately is crucial for goal reaching, neuroeconomics128, and the survival of humans and other animals2,3, and requires multiple biological mechanisms to track time over multiple timescales4?6. In mammals, the circadian clock that drives metabolic and behavioural rhythms is located in the SCN. 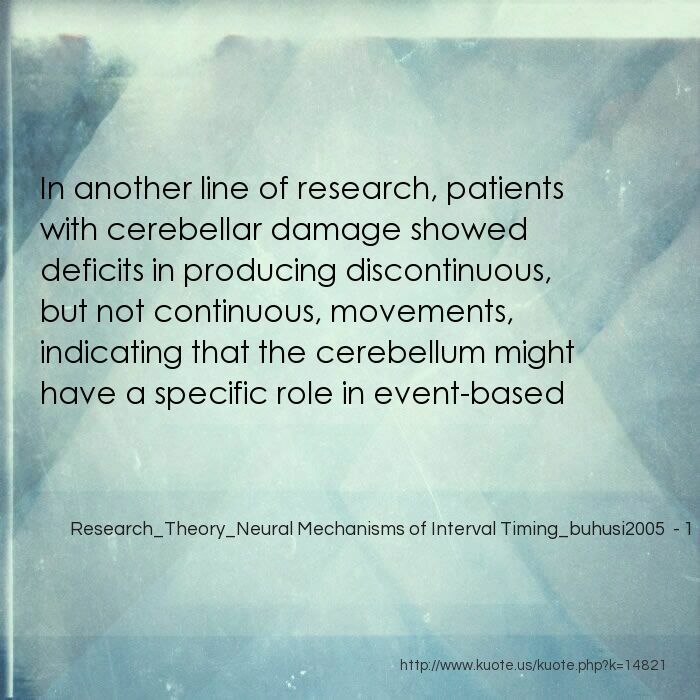 Another timer, which is responsible for automatic motor control in the millisecond range, relies on the cerebellum. In contrast to these relatively localized timing mechanisms, a general-purpose, flexible, cognitively controlled timer that operates in the seconds-to-minutes range involves the activation of a network of brain areas that form part of the thalamo-cortico-striatal circuits, notably the basal ganglia, the SMA, the PFC and the PPC. The operation of this network of circuits as a timekeeper can be better understood in terms of coincidental activation of various brain areas. As these areas are involved in several cognitive phenomena, it is likely that this circuit is not limited to temporal processing, but is also involved in other processes, such as the estimation of quantity or numerosity. This neural circuit might be able to switch function between coincidence detection for estimating time, to spike counting for estimating numerosity, depending on the accuracy that is required to solve the task127. As such, the coincidence-detection model and the pacemaker?accumulator model may be two sides ? neural and behavioural ? of the same coin. 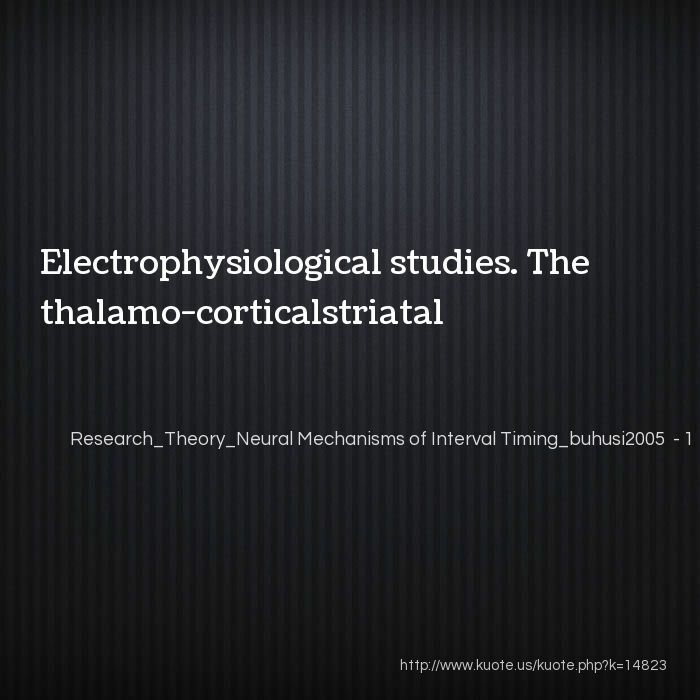 A crucial issue is to differentiate the roles of specific thalamo-cortico-striatal circuits in temporal cognition, for example, by using ensemble recording techniques. Another important question relates to the molecular bases of interval timing; in this respect, the use of transgenic animal models has the potential to shed light on the molecular foundations of the ?stopwatch?129. Finally, the development of modern computational tools and techniques to enable integration of information from all these techniques will soon be crucial for elucidating the processes that are involved in controlling working memory and motor functions, processing time, quantity or numerosity, attending to significant events, making decisions and calculating speed, productivity and rate of return. LONG?TERM DEPRESSION (LTD). An enduring weakening of synaptic strength that is thought to interact with LTP in the cellular mechanisms of learning and memory in structures such as the hippocampus and cerebellum. Unlike LTP, which is produced by brief high-frequency stimulation, LTD can be produced by long-term, lowfrequency stimulation. 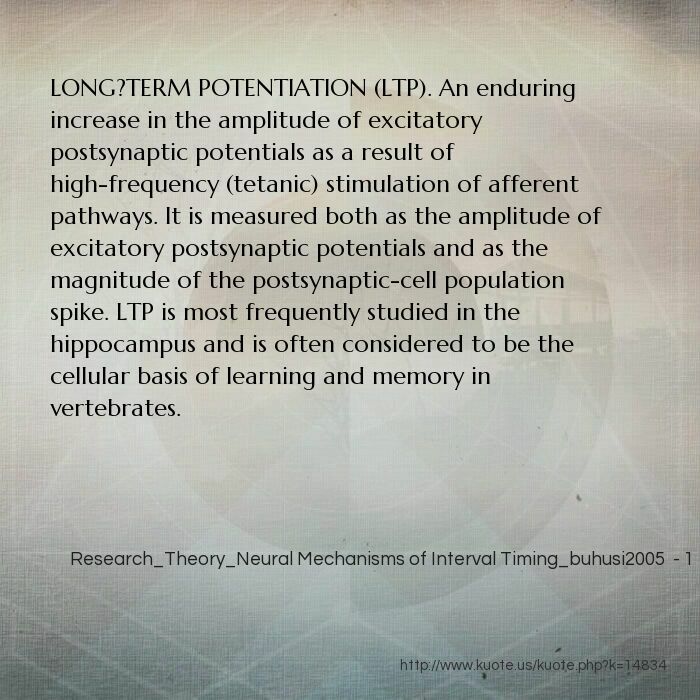 LONG?TERM POTENTIATION (LTP). An enduring increase in the amplitude of excitatory postsynaptic potentials as a result of high-frequency (tetanic) stimulation of afferent pathways. It is measured both as the amplitude of excitatory postsynaptic potentials and as the magnitude of the postsynaptic-cell population spike. 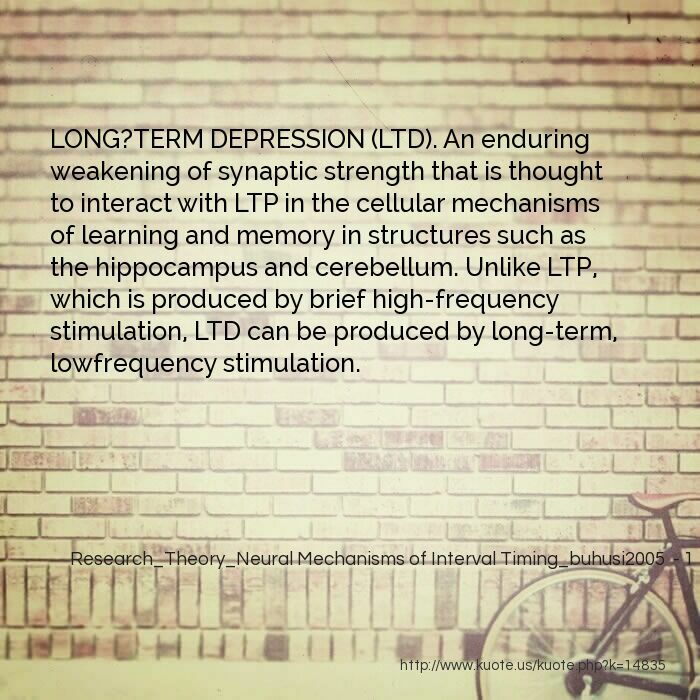 LTP is most frequently studied in the hippocampus and is often considered to be the cellular basis of learning and memory in vertebrates. 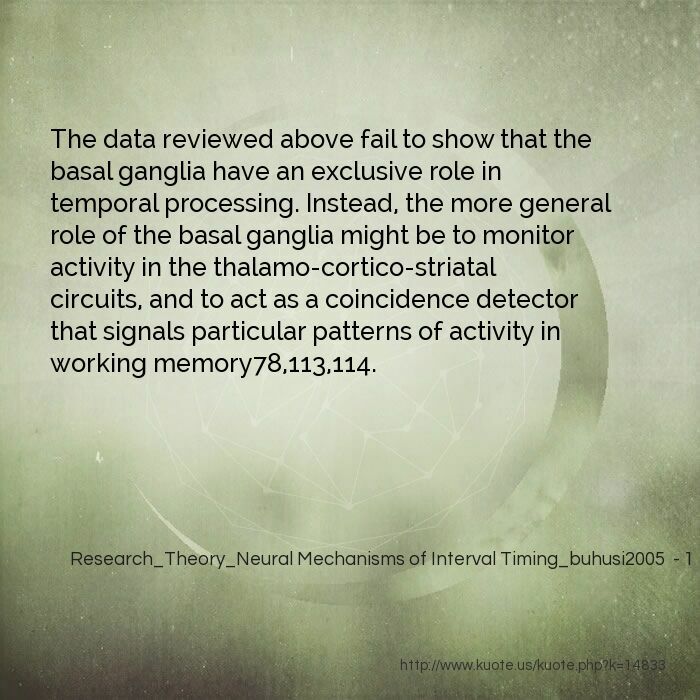 The data reviewed above fail to show that the basal ganglia have an exclusive role in temporal processing. Instead, the more general role of the basal ganglia might be to monitor activity in the thalamo-cortico-striatal circuits, and to act as a coincidence detector that signals particular patterns of activity in working memory78,113,114. This analysis revealed two clusters of foci. The ?automatic timing? 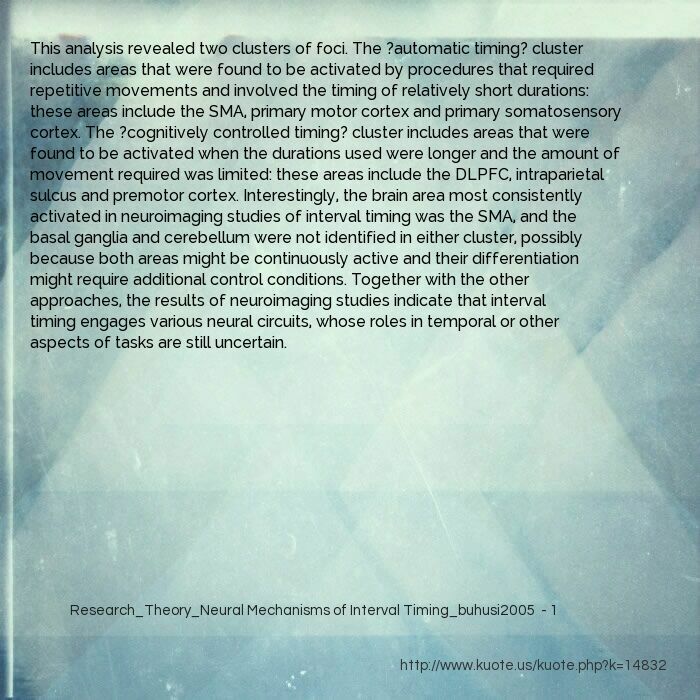 cluster includes areas that were found to be activated by procedures that required repetitive movements and involved the timing of relatively short durations: these areas include the SMA, primary motor cortex and primary somatosensory cortex. The ?cognitively controlled timing? cluster includes areas that were found to be activated when the durations used were longer and the amount of movement required was limited: these areas include the DLPFC, intraparietal sulcus and premotor cortex. Interestingly, the brain area most consistently activated in neuroimaging studies of interval timing was the SMA, and the basal ganglia and cerebellum were not identified in either cluster, possibly because both areas might be continuously active and their differentiation might require additional control conditions. 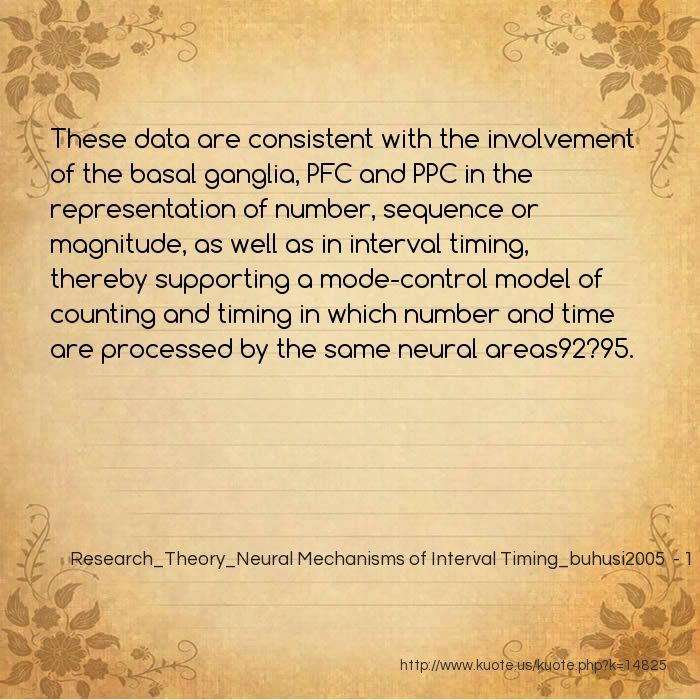 Together with the other approaches, the results of neuroimaging studies indicate that interval timing engages various neural circuits, whose roles in temporal or other aspects of tasks are still uncertain. 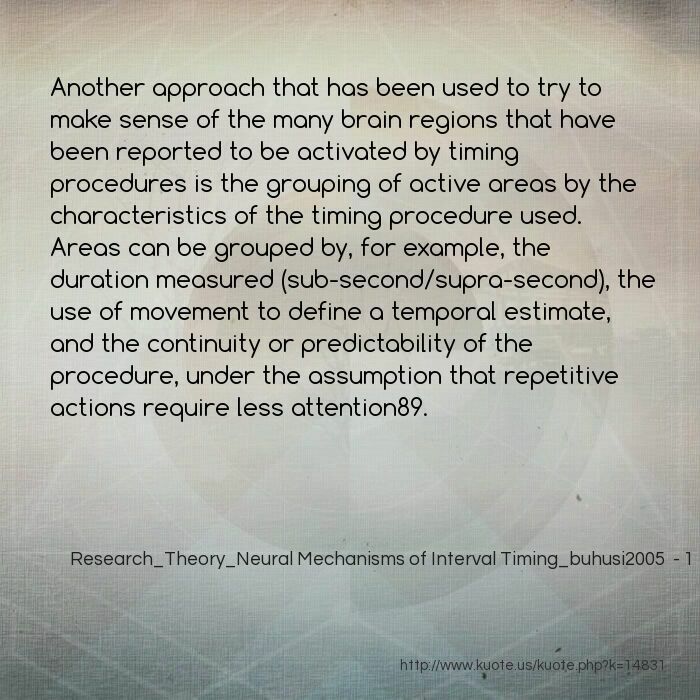 Another approach that has been used to try to make sense of the many brain regions that have been reported to be activated by timing procedures is the grouping of active areas by the characteristics of the timing procedure used. Areas can be grouped by, for example, the duration measured (sub-second/supra-second), the use of movement to define a temporal estimate, and the continuity or predictability of the procedure, under the assumption that repetitive actions require less attention89. This definition was successfully used in a recent study from the same group of researchers, in which participants were asked to direct their attention to the duration of an event or to its colour (FIG. 6a), thereby combining parametric variations in timing performance and appropriate control conditions (time versus colour). As expected, areas in the visual cortex showed a linear increase in activation when participants paid more attention to the colour of the stimuli (FIG. 6c,d). 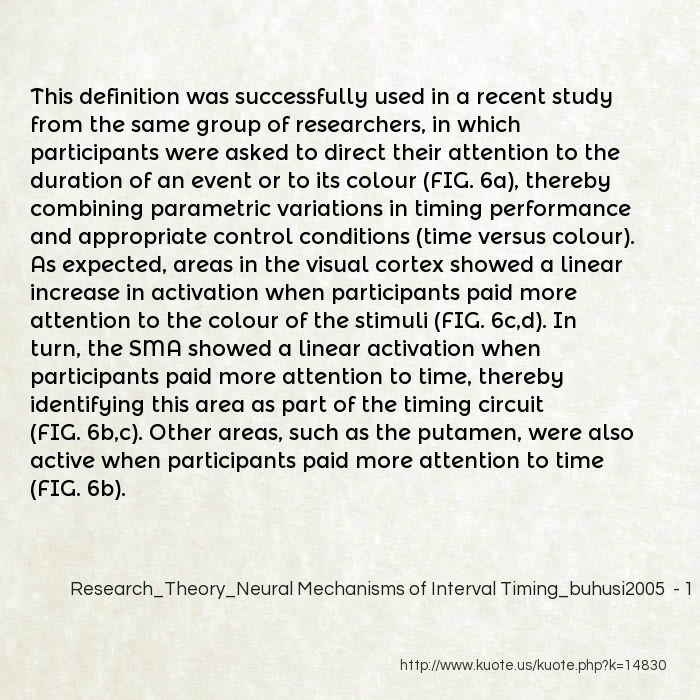 In turn, the SMA showed a linear activation when participants paid more attention to time, thereby identifying this area as part of the timing circuit (FIG. 6b,c). Other areas, such as the putamen, were also active when participants paid more attention to time (FIG. 6b). 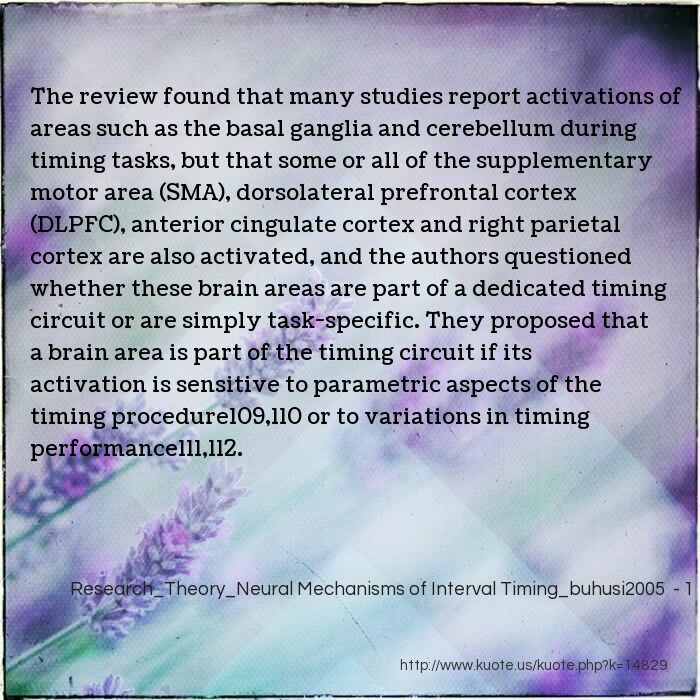 The review found that many studies report activations of areas such as the basal ganglia and cerebellum during timing tasks, but that some or all of the supplementary motor area (SMA), dorsolateral prefrontal cortex (DLPFC), anterior cingulate cortex and right parietal cortex are also activated, and the authors questioned whether these brain areas are part of a dedicated timing circuit or are simply task-specific. They proposed that a brain area is part of the timing circuit if its activation is sensitive to parametric aspects of the timing procedure109,110 or to variations in timing performance111,112. A recent study investigated neural activity in the agranular frontal cortex of rats that had been trained to time two stimuli of different durations107. 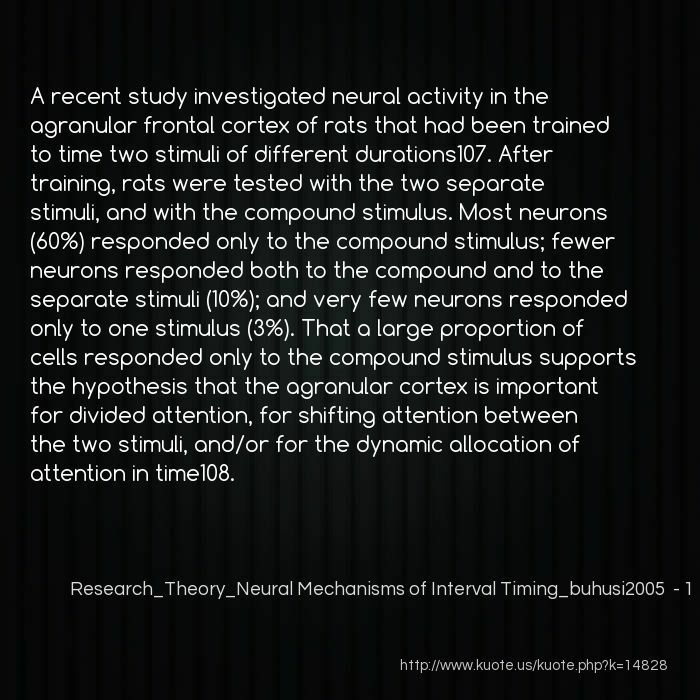 After training, rats were tested with the two separate stimuli, and with the compound stimulus. Most neurons (60%) responded only to the compound stimulus; fewer neurons responded both to the compound and to the separate stimuli (10%); and very few neurons responded only to one stimulus (3%). That a large proportion of cells responded only to the compound stimulus supports the hypothesis that the agranular cortex is important for divided attention, for shifting attention between the two stimuli, and/or for the dynamic allocation of attention in time108. 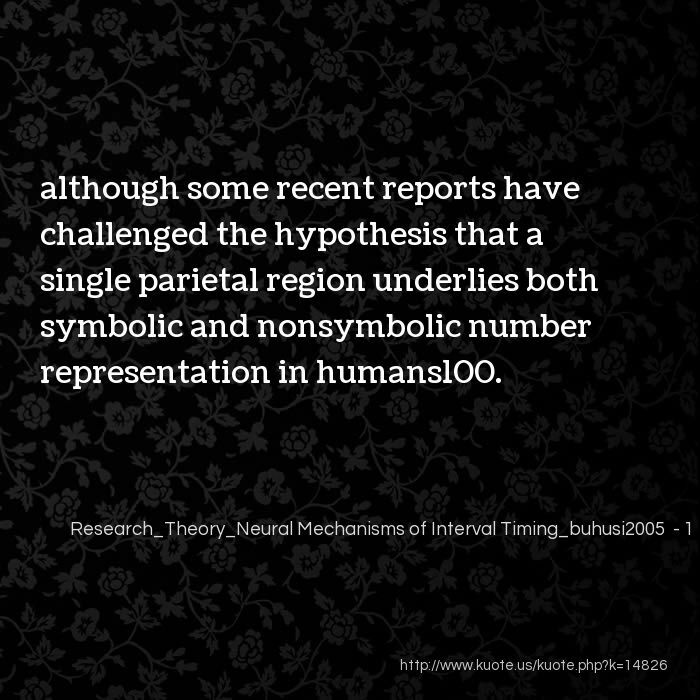 although some recent reports have challenged the hypothesis that a single parietal region underlies both symbolic and nonsymbolic number representation in humans100. 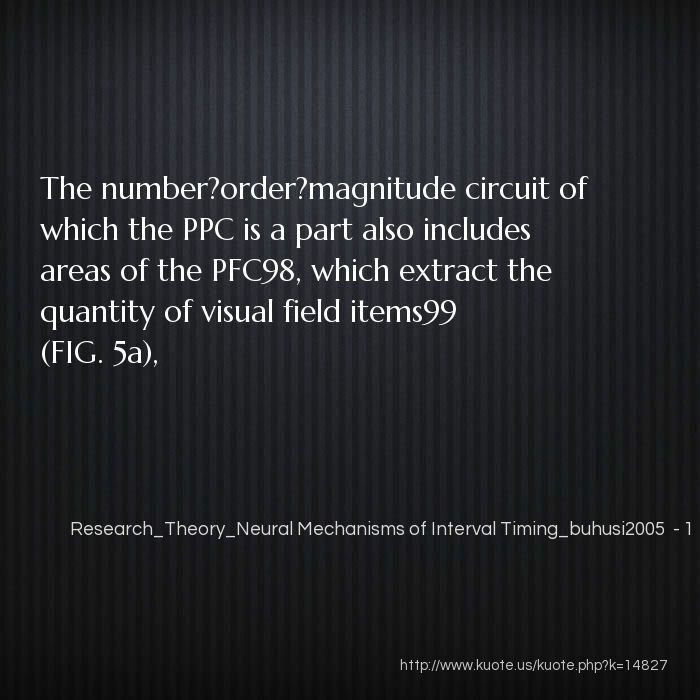 These data are consistent with the involvement of the basal ganglia, PFC and PPC in the representation of number, sequence or magnitude, as well as in interval timing, thereby supporting a mode-control model of counting and timing in which number and time are processed by the same neural areas92?95. 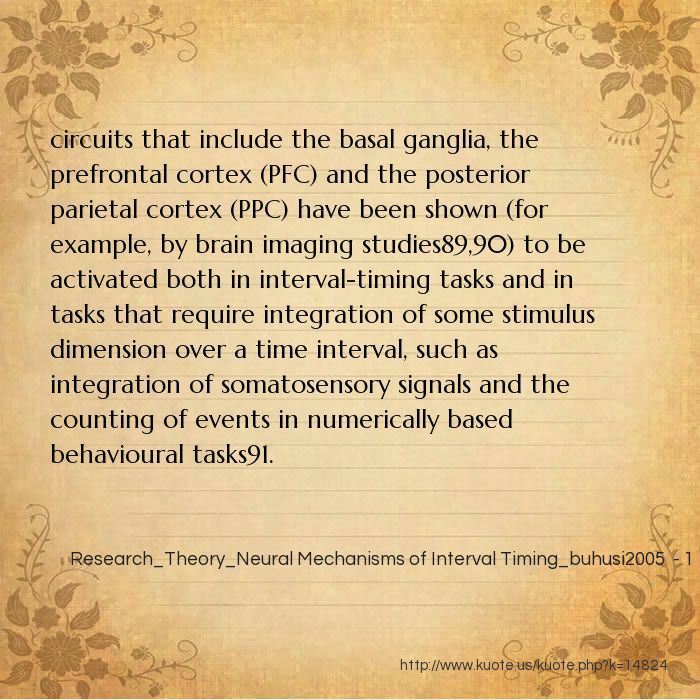 circuits that include the basal ganglia, the prefrontal cortex (PFC) and the posterior parietal cortex (PPC) have been shown (for example, by brain imaging studies89,90) to be activated both in interval-timing tasks and in tasks that require integration of some stimulus dimension over a time interval, such as integration of somatosensory signals and the counting of events in numerically based behavioural tasks91. 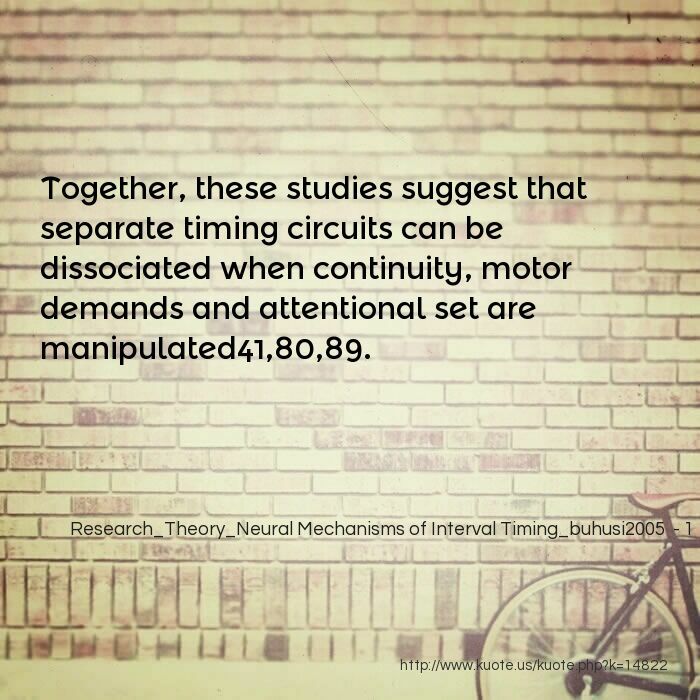 Together, these studies suggest that separate timing circuits can be dissociated when continuity, motor demands and attentional set are manipulated41,80,89. 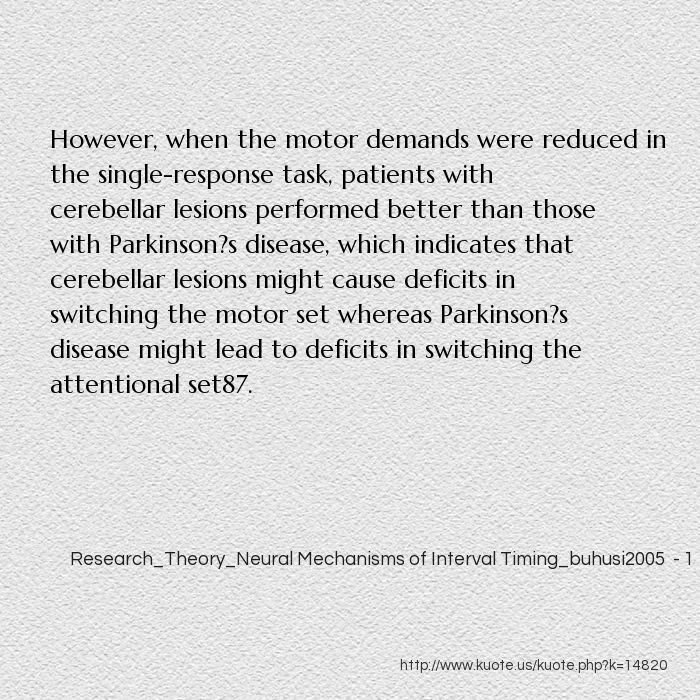 However, when the motor demands were reduced in the single-response task, patients with cerebellar lesions performed better than those with Parkinson?s disease, which indicates that cerebellar lesions might cause deficits in switching the motor set whereas Parkinson?s disease might lead to deficits in switching the attentional set87. 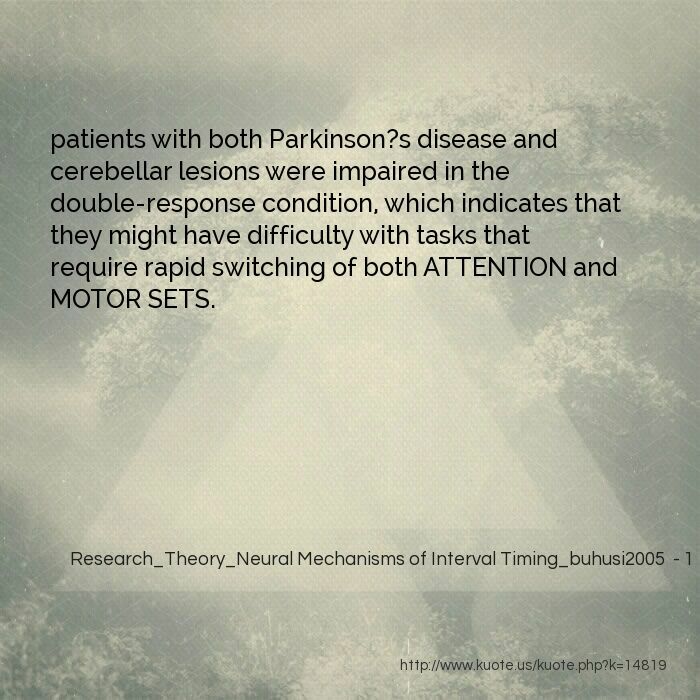 patients with both Parkinson?s disease and cerebellar lesions were impaired in the double-response condition, which indicates that they might have difficulty with tasks that require rapid switching of both ATTENTION and MOTOR SETS. 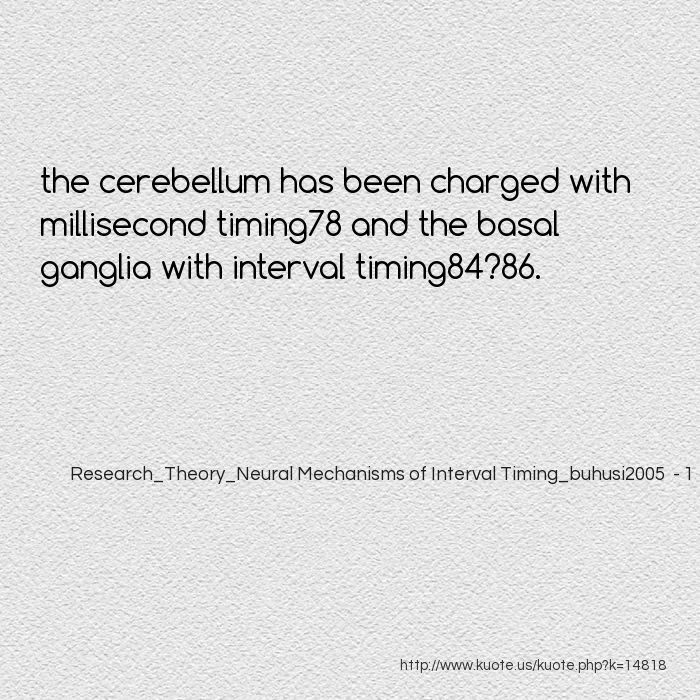 the cerebellum has been charged with millisecond timing78 and the basal ganglia with interval timing84?86. thalamus, pre-supplementary motor area (pre-SMA) and cingulate cortex. Patients in the ?HD far? 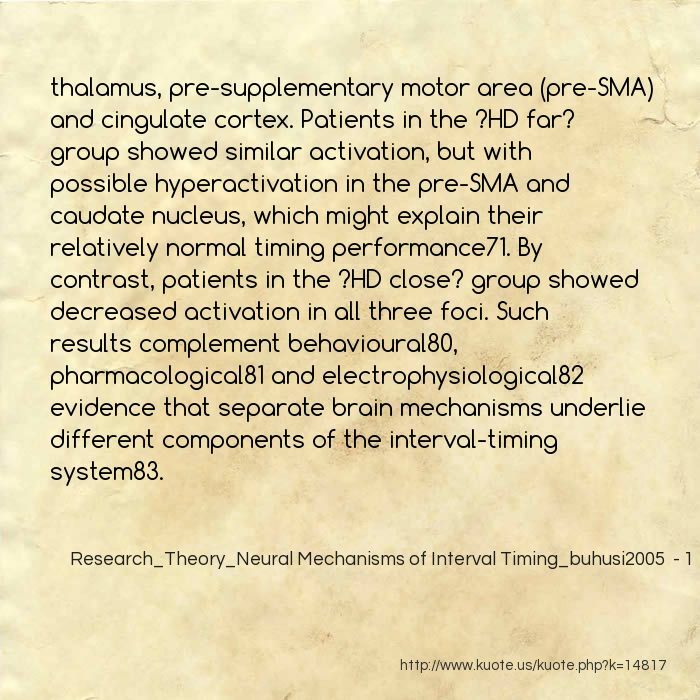 group showed similar activation, but with possible hyperactivation in the pre-SMA and caudate nucleus, which might explain their relatively normal timing performance71. By contrast, patients in the ?HD close? group showed decreased activation in all three foci. Such results complement behavioural80, pharmacological81 and electrophysiological82 evidence that separate brain mechanisms underlie different components of the interval-timing system83.